Faxes are a dying technology. In our view, email is more secure and reliable. Faxes, contrary to popular view, are a completely insecure method of transmitting a document. 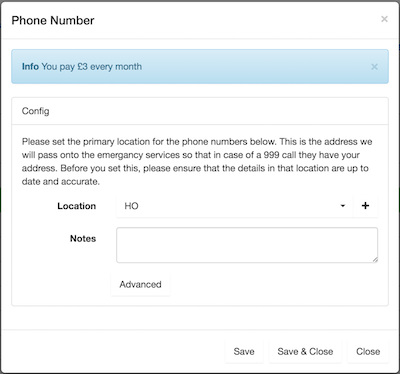 The document goes over the PSTN (Public Switched Telephone Network - i.e. BT) in a format that anyone listening in could decode it and view the document. This is not to mention how slow and expensive it is. Sending a fax takes several minutes to transmit and completely ties up the phone line whilst that one document is being sent. The document being sent transmits at 33,600 bits per second over a standard phone line. You will pay for a phone call for every fax which is sent. If you send an email over a modern broadband, it is sent at 500,000 bits per second even over the slowest broadband. Not only that, it will happily share this line with all users, so a queue of faxes are not waiting. Finally, it can be completely secured when sending a document over something like secure email (such as NHS Mail over N3). Emails are free (once the service is paid for). However, it is going to take a time to wean us off the fax system. 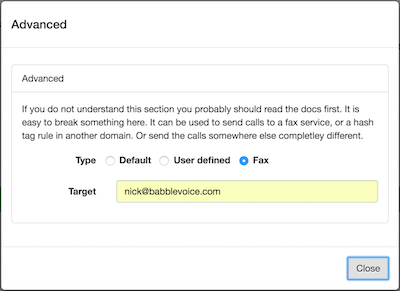 Quite often when users set up babblevoice in their business a fax number sits in the middle of a phone number range which has to port into babblevoice. So, sometimes, we have to look after fax numbers. So what can be done? In our console, you can edit a number and decide what can be done with it. By default, the number points to babblevoice so that a call rule can be invoked when someone calls that number. But you can alter that to receive faxes and then forward that fax to an email address. Important note, faxes are insecure. babblevoice does not secure the fax at this point. The fax is sent via email to the recipient. If the recipient is on NHS Mail, we understand, that at this point it can be considered secure. All normal good housekeeping rules regarding Information Governance should apply regarding who then has access. In the babblevoice console, go to the Stuff page. Edit the number (or range of phone numbers). You will see a screen like this. You will see a screen like this, this is how it should look to set it up as a fax. Note, use your email address! babblevoice does not support outbound fax. For an outbound service, you can either find a service on the Internet, alternatively, most broadband lines come with an analogue phone line. Most of our users use this line to plug in their existing fax machine.